Fishing is reported to be a bit slow in and around Sooke this week. Plus strong winds, especially in the afternoons, aren't helping much. However, there's still a few salmon to be found here and there, as shown by the photo from Roy at Blue Wolf Fishing Charters. He said "my guests were Wales and had never been on the Pacific before or salmon fishing. The 12 year old girl reeled in her fish, a whopping 32 lber! Not bad for her first time ever! The others were a 15 and a 22 lb buck." Regulation Update: As of July 15th, the "over/under" limit has expired. Before you could keep one wild chinook salmon above 67cm and then one hatchery or wild under 67cm. We are now back to "normal" or what the typical chinook salmon regulations are around here: 4 salmon in total, of which 2 may be chinook salmon above the minimum 45cm size. Sockeye Maybe? Apparently there's a huge run of sockeye in Port Alberni and hopes that the Fraser River sockeye have reappeared. 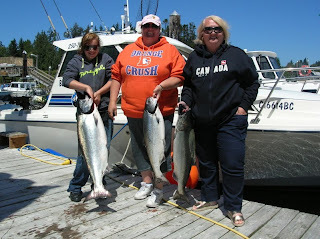 All going well, maybe we'll get another opening for sockeye in Sooke waters. It doesn't happen every year, but when it does, break out the sockeye gear and chase them quick, as the opening is usually only a few days! Mmm, sockeye. Red Tide: CFAX News reported a red tide warning -- be careful if you collect shellfish like mussels in local waters. THE DEPARTMENT OF FISHERIES AND OCEANS IS REMINDING SHELLFISH HARVESTERS THAT IT'S RED TIDE TIME AGAIN. THE DEPARTMENT SAYS EFFECTIVE IMMEDIATELY THE WATERS OF JUAN DE FUCA STRAIGHT FROM RACE ROCKS TO BONILLA POINT, INCLUDING SOOKE HARBOUR, SOOKE BASIN, AND PORT SAN JUAN, ARE CLOSED TO ALL CLAM, OYSTER, MUSSEL, AND SCALLOPS HARVESTERS BECAUSE OF PARALYTIC SHELLFISH POISONING. TO FIND OUT WHEN AND WHERE IT'S SAFE TO HARVEST SHELLFISH YOU CAN CONTACT YOUR LOCAL FISHERIES AND OCEANS OFFICE OR CHECK OUT THE DEPARTMENT OF FISHERIES ONLINE.